I first saw Kurt Vonnegut’s books in a used-bookstore when I was in high school or in college. His name sounded too serious, the books’ title also looked serious and so I wasn’t really interested in picking any of them. A few years back one of my dear friends, told me that Vonnegut was one of his favourite authors and I thought that I should read a Vonnegut book soon. Then fellow book blogger Emily recommended highly some of Vonnegut’s books (Thanks Emily! ), and I moved them to the top of my ‘TBR’ list. Then I read a review of Vonnegut’s book ‘God Bless You, Dr.Kevorkian’ in Ben’s blog, ‘My Deck of Cards‘ (you can find the review here) and I was wondering why I haven’t read a Vonnegut book yet. So I thought I will redeem myself and got a Vonnegut book when I was on a book-buying-binge last week and read it. It was ‘A Man without a Country’. I finished reading it yesterday. Here is the review. I am giving below a summary of the book as given on its back cover. This is vintage Vonnegut – hilariously funny and razor-sharp as he fixes his gaze on art, politics, himself and the condition of the soul of America today. Written over the last five years in the form of a loose memoir, A Man without a Country is an intimate and tender communication to us all, sometimes despairing, always searching and ultimately wise and compassionate. 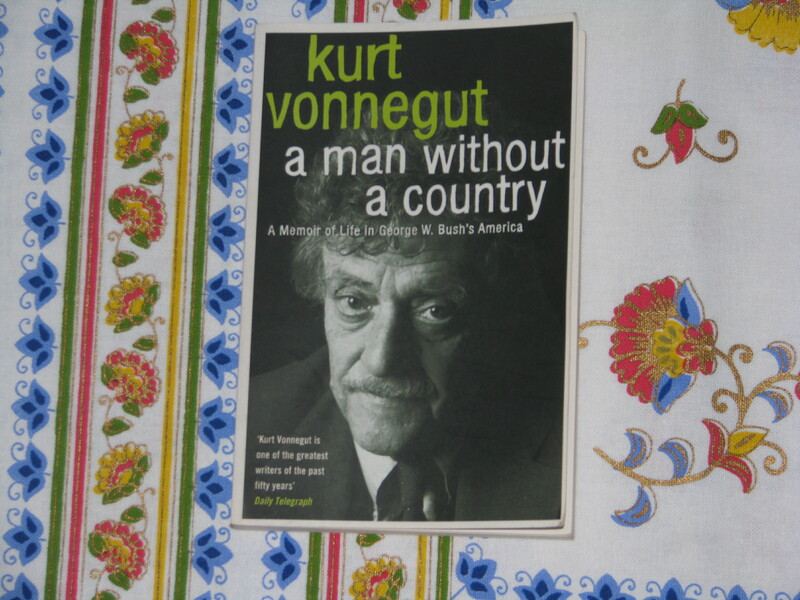 I don’t know what to say about ‘A Man without a Country’ beyond the fact that it was a slim book, it was a fast-paced read, I smiled at some of the things that Vonnegut said and laughed at others, and some of the passages made me think a bit. My original impression that Vonnegut writes seriously was wrong – he writes with a lot of humour but addresses serious issues. In some places, I couldn’t stop laughing, even when Vonnegut was discussing a serious topic. In many places Vonnegut pokes fun at the Washington establishment during George W.Bush’s time and he also touches on global warming and environmental issues, on Luddites, on the pleasures of snail mail when compared to email, about his love for music, about German Americans during the nineteenth century, about women and extended families and many other interesting topics. He even gives a lesson on creative writing, which is fun to read. There are twelve chapters in the book and all of them are reasonably independent and can be read on a standalone basis. “Before we attacked Iraq, the majestic New York Times guaranteed that there were weapons of mass destruction there”. Critics feel that a person cannot be a serious artist and also have had a technical education, which I had. I know that customarily English departments in universities, without knowing what they’re doing, teach dread of the engineering department, the physics department, and the chemistry department. And this fear, I think, is carried over into criticism. Most of our critics are products of English departments and are very suspicious of anyone who takes an interest in technology. So, anyway, I was a chemistry major, but I’m always winding up as a teacher in English departments, so I’ve brought scientific thinking to literature. There’s been very little gratitude for this. First rule : Do not use semicolons. They are transvestite hermaphrodites representing absolutely nothing. All they do is show you’ve been to college. I sure wish I could wave a wand, and give every one of you an extended family, make you an Ibo or a Navaho – or a Kennedy. Now, you take George and Laura Bush, who imagine themselves as a brave, clean-cut little couple. They are surrounded by an enormous extended family, what we should all have – I mean judges, senators, newspaper editors, lawyers, bankers. They are not alone. That they are members of an extended family is one reason they are so comfortable. And I would really, over the long run, hope America would find some way to provide all of our citizens with extended families – a large group of people they could call on for help. I have been called a Luddite. Do you know what a Luddite is? A person who hates newfangled contraptions. Ned Ludd was a textile worker in England at around the start of the nineteenth century who busted up a lot of new contraptions – mechanical looms that were going to put him out of work, that were going to make it impossible for him with his particular skills to feed, clothe, and shelter his family. In 1813 the British government executed by hanging seventeen men for “machine breaking”, as it was called, a capital crime. Today we have contraptions like nuclear submarines armed with Poseidon missiles that have H-bombs in their warheads. And we have contraptions like computers that cheat you out of becoming. Bill Gates says, “Wait till you can see what your computer can become.” But it’s you who should be doing the becoming, not the damn fool computer. What you can become is the miracle you were born to be through the work that you do. Progress has beat the heck out of me. It took away from me what a loom must have been to Ned Ludd two hundred years ago. I mean a typewriter. There is no longer such a thing anywhere. And the masses of humanity through the ages, feeling inadequately educated just like we do now, and rightly so, have had little choice but to believe this guesses or that one. Persuasive guessing has been at the core of leadership for so long, for all of human experience so far, that it is wholly unsurprising that most of the leaders of this planet, in spite of all the information that is suddenly ours, want the guessing to go on. It is now their turn to guess and guess and be listened to. Some of the loudest, most proudly ignorant guessing in the world is going on in Washington today. Our leaders are sick of all the solid information that has been dumped on humanity by research and scholarship and investigative reporting. They think that the whole country is sick of it, and they could be right. It isn’t the gold standard that they want to put us back on. They want something even more basic. They want to put us back on the snake-oil standard. The more hydrogen bomb warheads we have, all set to go off at a moment’s notice, the safer humanity is and the better off the world will be that our grandchildren will inherit. Industries should be allowed to do whatever they want to do : Bribe, wreck the environment just a little, fix prices, screw dumb customers, put a stop to the competition, and raid the Treasury when they go broke. And if you actually are an educated, thinking person, you will not be welcome in Washington, D.C. I know a couple of bright seventh graders who would not be welcome in Washington, D.C. Do you remember those doctors a few months back who got together and announced that it was a simple, clear medical fact that we could not survive even a moderate attack by hydrogen bombs? They are not welcome in Washington, D.C.
What is the response in Washington? They guess otherwise. What good is an education? The boisterous guessers are still in charge – the haters of information. And the guessers are almost all highly educated people. Think of that. They have had to throw away their educations, even Harvard and Yale educations. If they didn’t do that, there is no way their uninhibited guessing could go on and on and on. Please, don’t you do that. But if you make use of the vast fund of knowledge now available to educated persons, you are going to be lonesome as hell. The guessers outnumber you – and now I have to guess – about ten to one. (Comment : I couldn’t stop laughing when I read this passage. It also made me think. Though things might have changed a bit now, it is scary to think that people in responsible positions resort to guessing most of the time, to make important decisions). I enjoyed reading ‘A Man without a Country’. I loved Kurt Vonnegut’s humour and the way he discusses difficult and serious issues with humour. In many places I felt that Vonnegut’s made me laugh despite seeming to not try at all (he says otherwise though, in one of the chapters in the book). If you haven’t read Kurt Vonnegut before, or if you haven’t read this book, you should try it. It is wonderful. I am going to read more Kurt Vonnegut books now – I will probably try reading ‘Cat’s Cradle’ or ‘Mother Night’ or ‘Slaughterhouse-Five’ soon. 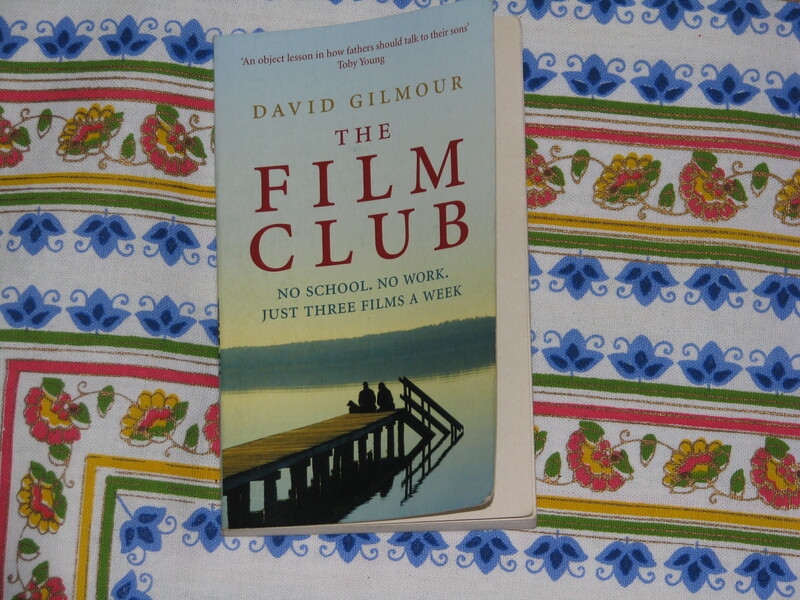 I saw ‘The Film Club’ by David Gilmour last week, when I was on a book-browsing-session at the bookstore, which ended in a book-buying-binge! I got hooked in by the blurb and couldn’t resist the book. I have never heard of David Gilmour before and so I thought it would also be nice to experiment with a new author. I finished reading the book yesterday. Here is the review. David Gilmour was at his wits’ end with his teenage son. Despite Jesse failing at school, nothing David said seemed to be getting through to him. So he came up with an unconventional deal : Jesse could leave school, sleep all day, not work, not pay rent – but he had to watch three films a week of his father’s choosing. I thought he was writing about me 🙂 (Well, luckily, my marks didn’t topple in grade ten, but they did in grade eleven!) If you are parent of a teenager, or if you have been a rebellious teenager yourself (can teenagers be otherwise :)) you will identify with Gilmour and / or with his son Jesse. I did. If you love movies and like reading about them and fancy yourself as an amateur film critic, you will love this book. There were discussions of many of the famous classic movies, movies from the golden era of Hollywood, famous movies which are more closer to our times and also lesser known movies which seem to be gems. Gilmour himself was a film critic for sometime and so his analysis of films is a delight, though one may not agree with some of his comments on some of the films. I picked the debut of a young director as part of our “Talent Will Out” programme. To this day, this largely forgotten little TV movie remains one of the most exhilarating pieces of youthful, look-at-me filmmaking I’ve ever seen. Movies for television tend not to be the domain of the brilliant, but seconds into Duel (1971), you can tell that something odd is going on. You see, from the driver’s point of view, a car leaving the pleasant suburbs of some American city and heading slowly out of town. It’s a hot day : blue sky, houses thin out, traffic thins out; the car is alone. Then, out of nowhere, a rusted, eighteen-wheel transport truck appears in the rear-view mirror. Its windows are shaded. You never see the driver. You glimpse his cowboy boots, his hand waving out the window, but never his face. A truck and a car; no dialogue between them. Just running down the highway. How, I ask Jesse, could anyone animate such material? “Like squeezing wine from a rock,” he said. I suggest that the answer lies in the director’s visual attack. Duel compels you to look at it. It seems to say to the audience : there is something of primordial importance going on here; you have feared this very thing before and now here it is again. Steven Spielberg was twenty-two when he directed Duel. He’d done some television…but not one anticipated that he was going to tear up the material with quite this relish. More than the truck, more than Dennis Weaver’s escalatingly frightened driver, the director is the star of Duel. Like reading the first pages of a great novel, you sense you’re in the presence of an enormous, incautious talent. It hasn’t learned to second-guess itself, to be too smart. Which is what, I suppose, Spielberg meant a few years ago when he told an interviewer that he tried to rewatch Duel every two or three years in order to “remember how I did it”. You have to be young, he implied, to be so unapologetically sure-footed. You can see why studio executives took one look at Duel and gave him Jaws (1975) a few years later. If Spielberg could make an unwieldy truck scary, just imagine what he could do with a shark, which, like the driver of the truck, remains out of sight for much of the movie. You see only its effects, a missing dog, a girl pulled suddenly underwater, a buoy exploding to the surface, things that announce the presence of danger but never give it a face. Spielberg intuited at an early age that if you want to scare people, let their imaginations do the heavy lifting. When Clint was offered the script for A Fistful of Dollars it had already been around for a while. Charles Bronson said no, it was the worst script he’d ever seen. James Coburn didn’t want to do it because it was going to be shot in Italy and he’d heard bad things about Italian directors. Clint took it for a fee of fifteen thousand dollars but – and I emphasised this for Jesse – insisted on cutting down the script, thought it would be more interesting if the guy didn’t talk. I liked the book for being a paean sung in the glory of movies and also for touching topics which are probably dear to most of us – on parents’ relationship with their children, and how children have a troubled and rebellious time during their teens, on relationships and loss and handling the emotional impact of them and how conversations between parents and children can be more joyful and meaningful. Gilmour has used the excuse of writing a memoir to indulge in his favourite topic – the movies – but I loved that, and so I don’t have any complaints about it 🙂 I also think that this book would make a good movie too. One of the minor complaints I had about the book was that while Jesse talks about his relationships with his girlfriends and Gilmour shares his thoughts on the same, in terms of films, it is Gilmour who does all the talking most of the time and sometimes it sounds like a monologue which goes on and on. I would have loved to know what Jesse thought on different films and how he related to them (though Jesse does talk about this sometimes). …there was a small unhaveable part in Jesse, something all the other boys gave her which he, for reasons I still don’t understand, withheld; a single, dark room in the mansion to which Rebecca had no access and it obsessed her. You knew the moment she got in there with a flashlight, the moment she understood she could come and go, it would be a valueless room, he would be valueless, and she’d move on. But for the moment it was a locked door and she waited outside trying to find the key that would turn the lock. By now the sky had turned a dark, rich blue, a red bar running across the horizon. Such extraordinary beauty, I thought, all over the world. Is it, you had to wonder, because there is a God or is it simply how millions and millions and millions of years of absolute randomness looked? Or is it simply the stuff you think about when you’re happy at four o’clock in the morning? You have to start somewhere; if you want to excite someone about literature, you don’t start by giving him Ulysses – although, to be candid, a life without Ulysses seems like just a fine idea to me. I went on to say, to repeat rather, what my betters had told me in university : that the second time you see something is really the first time. You need to know how it ends before you can appreciate how beautifully it’s put together from the beginning. There’s a sort of rushed-homework feel to Woody Allen’s movies these days, as if he’s trying to get them finished and out of the way so he can move on to something else. That something else, distressingly, is another movie. It’s a downward spiral. But still, after making more than thirty films, maybe he’s done his life’s work; maybe he’s entitled to cruise on whatever gas he wants from here on in. It’s hard for someone who didn’t grow up in the early sixties, I said, to imagine how important the Beatles were. Barely out of their teens, they were treated like Roman emperors everywhere they went. They had the extraordinary quality of making you feel as if, in spite of their hysterical popularity, you alone understood how great they were, that they were somehow your own private discovery. And then there is Gary Cooper. Actors who worked with him were often surprised at how little he did during a scene. It seemed as if he hardly acted, hardly did anything at all. But when you see his performance onscreen, it pushes everybody else into the background. Actors saw their performances disappear into a blur around him. And how, I wondered, how could I make Jesse understand this, how could I rush him through the next months, even year, to that delicious end point where you wake up one day and instead of feeling her loss, that toothache, you find yourself yawning, putting your hands behind your head and thinking, “I must get a copy made of my house key today. I’m playing a rather dangerous game here, having only one key.” Gorgeously banal, liberating thoughts, the heat having passed from the burn, the memory of its pain so remote that you can’t quite put your finger on why it went on so long or what the fuss was about, or who did what with her body (but look, the neighbours are planting a new birch tree). And then something happened that felt like the full stop at the end of a sentence. It made me feel that my bad luck had run its course. To the eyes of an outsider, it was no big deal. I was invited to write a film review for a national newspaper. The pay was low, it was a one-shot gig, but – how to explain this – it was something I had always wanted to do. Sometimes these things have a lure well beyond their actual value, like an academic asked to give a lecture at the Sorbonne or an actor being in a movie with Marlon Brando. (Maybe it’s a terrible movie. Doesn’t really matter). Jesse was working the evening shift. He was still a prep man, washing and cutting up vegetables, cleaning squid, but sometimes they let him work the grill, which had the same slightly disproportionate lure that my film review did. These things were dismayingly arbitrary. 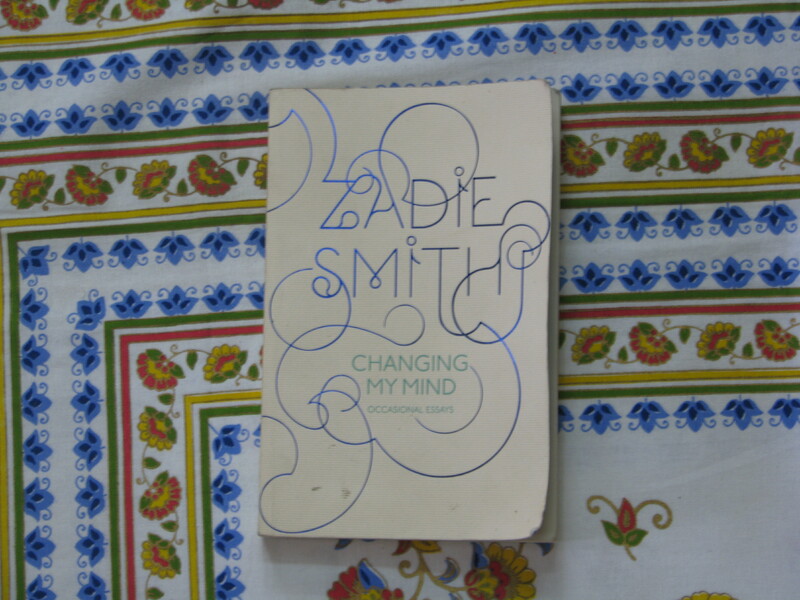 When I was on one of my bookstore browsing trips a few months back, I saw Zadie Smith’s ‘Changing My Mind’. It has been a while since I last saw a new book written by Zadie Smith and so I thought that I will find out what was there between the covers. I read Smith’s ‘Foreword’ and the first few pages of the first essay ‘Their Eyes Were Watching God : What does Soulful Mean?’ The essay had a wonderful start and kept me hooked. But I was on a self-imposed-book-buying-ban then, and so reluctantly I put the book back on the shelf. But everytime I went to the bookstore after that, Zadie Smith’s essay collection leapt at me. Then one day I decided that it was time to get it. I went to the bookstore at around their closing time, pleaded with the guard there to let me in, told the bookstore assistant that I needed just one book and went to look for Zadie Smith’s book. But, strangely, the only copy which was there in the store had disappeared! I couldn’t believe that a book which was lying around for so long, had suddenly disappeared exactly at the time I wanted to read it! But the bookstore assistant said that the book might still be there, and we started combing the bookshelves. It was getting late and I was prepared to be disappointed, when, once again, Zadie Smith’s book leapt at me from its hiding place. I am not one to look a gift horse in the mouth and so I immediately got it and ran home, lest any misfortune befall me or the book on the way back. I started reading it nearly a couple of weeks back, but got distracted by life, and finished it only yesterday. Here is the review. I am giving below the summary of the book, as given in the inside of the book’s cover. How did George Eliot’s love life affect her prose? Why did Kafka write at three in the morning? In what ways is Barack Obama like Eliza Doolittle? Can you be over-dressed for the Oscars? What is Italian Feminism? If Roland Barthes killed the Author, can Nabokov revive him? What does ‘soulful’ mean? Is Date movie the worst film ever made? Split into five sections – ‘Reading’, ‘Being’, ‘Seeing’, ‘Feeling’ and ‘Remembering’ – Changing My Mind finds Zadie Smith casting an acute eye over material both personal and cultural. This engaging collection of essays – some published here for the first time – reveals Smith as a passionate and precise essayist, equally at home in the world of great books and bad movies, family and philosophy, British comedians and Italian divas. Whether writing of Obama, Katherine Hepburn, Kafka, Anna Magnani or David Foster Wallace, she brings a practitioner’s care to the art of criticism, with a style as sympathetic as it is insightful. Changing My Mind is journalism at its most expansive, intelligent and funny – a gift to readers and writers both. Within its covers an essay is more than a column of opinions; it’s a space in which to think freely. When Hollywood thought it knew what a woman was, or what a black man was, or what an intellectual might be, or what ‘sexiness’ amounted to, Hepburn made a movie to turn the common thinking on its head, offering always something irreducibly singular. Little Women, in which Hepburn played the greatest, most emphathic beautiful Jo March there ever has been or ever will be. I judged too quickly, thinking him one of those actors who prides himself on making the big bad movies in order to fund the small good ones – a kind of vanity tax upon the audience, whereby the pointless shoot-’em-up is the price we supposedly pay for the chilly little chamber piece about divorce. Clooney is not that actor. He doesn’t make sterile, unlovable vanity projects. In a cultural climate that ridicules and is repulsed by intellectual and moral commitment, in his way he pursues both. With his role as executive producer and front-of-shop ‘face’ of Syriana, he has now created an unprecedented scenario : the most popular actor in Hollywood is also the man who wants to agitate us most. Something like this has happened only once before, with Marlon Brando, an actor whose personal failings and self-regard overran all his most serious ambitions. Clooney appears to have no such tragic flaw. He is making real American films instead of American products; he is helping real American films to get made. At a time when most people with half a brain cell have long given up on the products of the American multiplex, Clooney gives us a reason to put our foot back through the door and cautiously buy some popcorn. Rarely in the history of Hollywood has so much personal charm been put to such good use. It looks like Clooney continues to impress moviegoers (and Zadie Smith) with movies like ‘Michael Clayton’ and ‘Up in the Air’. I found Smith’s essays on literary criticism and on books and writers tougher to read – though these were of varying levels of difficulty. Most of them require a bit of effort, but are a pleasure to read and have beautiful insights and thoughts. Some of my favourite essays from the book are from this section – on Zora Neale Hurston’s ‘Their Eyes Were Watching God’ (the first essay which hooked me to the book), on E.M.Forster, on George Eliot’s ‘Middlemarch’ and on Kafka (he seems to be such a fascinating person! Have to read his biography sometime). I also liked very much the essay called ‘That Crafty Feeling’ where Zadie Smith gives advice to budding writers. Why is the greatest facilitator of inauthenticity Asian? Why is the closest thing to epiphany a dead black man? Because Remainder, too, wants to destroy the myth of cultural authenticity – though for purer reasons than Netherland. If your project is to rid the self of its sacredness, to flatten selfhood out, it’s philosophical hypocrisy to let any selves escape, whatever colour they may be. The nameless ‘dead black man’ is a deliberate provocation on McCarthy’s part, and in its lack of coy sentiment there is a genuine transgressive thrill. Still, it does seem rather hard to have to give up on subjectivity when you’ve only recently got free of objectification. For the depressed person pain has certainly been fetishized, pathologized : she can’t feel simple sadness, only ‘agony’; she’s not merely depressed, she is ‘in terrible and unceasing emotional pain’. Meanwhile, another kind of pain – the kind one feels for other people in their suffering – is inaccessible to her. When one of her Support System becomes terminally ill, the only pain this causes her (i.e. the depressed person) is the realization that she doesn’t really care at all, which in turn sparks in her mind the dreaded possibility that she might in fact be ‘a solipsistic, self-consumed, endless emotional vacuum and sponge’. She is disgusted by herself, and the disgust causes her yet more pain and pica-gnawed hands, and on it goes in its terrible cycle…. The spiral sentences, the looping syntax, the repetition, the invasion of clinical vocabulary – none of this is mere ‘formal stunt-pilotry’. Nor does it add up to nonsense, or ‘stream of consciousness’ if sloppiness and incomprehensibility is meant by that term : however long they are, Wallace’s procedures are always grammatically immaculate. The point is to run a procedure – the procedure of another person’s thoughts! – through your own mind. This way you don’t merely ‘have’ the verbal explanation. To be fair, on reading the above paragraph again, I don’t think it was as tough as it was when I read it yesterday. I think one of the problems for me was that I have never studied literary criticism or literary theory formally. So, I found some of the language in the above essays quite densely-packed which took time to read and understand – like a mathematics textbook. If you are familiar with the language of literary criticism, reading and understanding the above might be child’s play for you. If you are not very familiar with the language of literary criticism, consider yourself forewarned. If I ignore the ‘tough-to-read’ essays, I would say that I enjoyed reading Zadie Smith’s essay collection very much. Her essays on books, writers and films gave me a lot of pleasure. I flattered myself I ranged widely in my reading, never choosing books for genetic or sociocultural reasons…I had my own ideas of ‘good writing’. It was a category that did not include aphoristic or overtly ‘lyrical’ language, mythic imagery, accurately rendered ‘folk speech’ or the love tribulations of women….Three hours later I was finished and crying a lot, for reasons that both were, and were not, to do with the tragic finale. I lost many literary battles the day I read ‘Their Eyes were Watching God’….At fourteen, I did Zora Neale Hurston a critical disservice. I feared my ‘extraliterary’ feelings for her. I wanted to be an objective aesthete and not a sentimental fool. I disliked the idea of ‘identifying’ with the fiction I read : I wanted to like Hurston because she represented ‘good writing’, not because she represented me. “The voice I speak with these days, this English voice with its rounded vowels and consonants in more or less the right place – this is not the voice of my childhood. I picked it up in college, along with the unabridged Clarissa and a taste for port. Maybe this fact is only what it seems to be – a case of bald social climbing – but at the time, I genuinely thought this was the voice of lettered people, and that if I didn’t have the voice of lettered people I would never truly be lettered. A braver person, perhaps, would have stood firm, teaching her peers a useful lesson by example : not all lettered people need be of the same class, nor speak identically. I went the other way. Partly out of cowardice and a constitutional eagerness to please, but also because I didn’t quite see it as a straight swap, of this voice for that. My own childhood had been the story of this and that combined, of the synthesis of disparate things. It never occurred to me that I was leaving Willesden for Cambridge. I thought I was adding Cambridge to Willesden, this new way of talking to that old way. Adding a new kind of knowledge to a different kind I already had. And for a while, that’s how it was : at home, during the holidays, I spoke with my old voice, and in the old voice seemed to feel and speak things that I couldn’t express in college, and vice versa. I felt a sort of wonder at the flexibility of the thing. Like being alive twice. To occupy a dream, to exist in a dreamed space (conjured by both father and mother), is surely a quite different thing from simply inheriting a dream. It’s more interesting. What did Pauline Kael call Cary Grant? “The Man from Dream City”. When Bristolian Archibald Leach became suave Cary Grant, the transformation happened to his voice, which he subjected to a strange, indefinable manipulation, resulting in that heavenly sui generis accent, neither west country nor posh, American nor English. It came from nowhere, he came from nowhere. Grant seemed the product of a collective dream, dreamed up by moviegoers in hard times, as it sometimes feels voters have dreamed up Obama in hard times. Both men have a strange reflective quality, typical of the self-created man – we see in them whatever we want to see. ‘Everyone wants to be Cary Grant,’ said Cary Grant. ‘Even I want to be Cary Grant’. It’s not hard to imagine Obama having the same thought, backstage at Grant Park, hearing his own name chanted by the hopeful multitude. Everyone wants to be Barack Obama. Even I want to be Barack Obama. Two years ago I went to see The Philadelphia Story play on a big screen in Bryant Park. It was July and so hot my brother and I had been spending the day in the penguin exhibit at the zoo (we had no air-conditioning), but then we heard about the film – my favourite film – playing outdoors and rushed downtown. We were too late to get a seat. It was packed like I have never seen any New York open space since the Dalai Lama came to Central Park. We were disconsolately looking for a wall to sit on, when suddenly two unholy fools, two morons, changed their minds and gave up their second-row seats. Hard to describe how happy we were. And then over the loudspeakers came some news : Hepburn had been taken ill in the night – gasps, I mean, real gasps – but it was okay – happy sighs – she was back from the hospital and wished us all well. We roared! And then the film started, and I said all the lines before they came, and my brother asked me to shut up. But I wasn’t the only one at it. When Katharine whispered to Jimmy Stewart, ‘Put me in your pocket, Mike!’ a thousand people whispered with her. That was the best night at the movies I’ve ever had. I liked Zadie Smith’s ‘Changing My Mind’ very much. Though some of the essays were tough to read for me, I enjoyed the book as a whole and it was a pleasure to read. If you like reading literary essays and journalistic pieces together, this is the book for you. Zadie Smith’s last novel ‘On Beauty’ was published in 2005 – five years back. She herself admits in the foreword to ‘Changing My Mind’ that she was planning to write two books – a novel and a nonfiction book on the art and craft of writing, but the deadlines for them came and went. I also read in Wikipedia that she has now become a tenured professor in New York university. It means that she doesn’t need to write novels for a living anymore – she can just teach students how to write novels and write the occasional essay in a literary magazine like the ‘New Yorker’. It is a good thing, because writers of a previous era had to give up a lot for their art and passion and it is good that today’s writers have interesting opportunities to live a more financially stable life. But this is not the situation that Zadie Smith’s readers are happy with. They want more 🙂 Zadie, when is your next novel coming out? We are all waiting for it. I don’t normally write about music, because I think I am not well-equipped to write about it. But inspired by my dear friend and fellow blogger M…..l and by the events of Friday, I am compelled to write this post about one of the delightful pleasures of life. There was a rock concert scheduled near my home, yesterday (Friday) night, at a small amphitheatre. This beautiful and cute amphitheatre had somehow leapt into existence while I was sleeping. I didn’t even know that it existed, till I went there to see a play last week, though it is just five minutes walk from my home. The surprising thing was that it is next to a wonderful cafe, where I have been a few times (this cafe called the ‘Tryst Cafe’ has the best chocolate eclair that I have tasted in recent times. It also has the softest croissants around. You can find an article which raves about Tryst Cafe, here). This cute amphitheatre is actually out in the open, surrounded by a cafe, a clothing store, a home store and a furniture mart that one doesn’t even notice it – it just proves the old adage that when you want to hide something, leave it in the open and no one will notice it. Atleast I didn’t. When I did, it was one of the delightful surprises of life. So, I went to this amphitheatre to listen to the concert. I haven’t been a rock concert recently (and to even concerts in general) and so was looking forward to it. The band which came to perform was called ‘Off the Record’ and was made up of young musicians. The lead singer Shakthi, had a rich voice with a wide range. It was awesome the way she effortlessly took her voice to a pitch which was high, ‘higher’ and ‘highest’ and then brought it back to ‘ground-level’ again. When I asked her after the concert how she did it so effortlessly, she said that she was a classical (Carnatic) music singer too. It is interesting, isn’t it, how talented people port their creative talent from one area to another. The lead guitarist, Vikram, joined in the singing occasionally, and played the guitar like a genius. I was hoping that the band would play Pink Floyd’s ‘The Wall’ and he would extract the maximum out of his guitar, but unfortunately, the band didn’t play that song. The bass guitarist Satish played his role excellently and the drummer (forgot his name) played the drums like a genius and his competition, or rather his (musical) conversation with the lead guitarist, was a treat to watch. The band members poked fun at each other, goaded each other during the performance and seemed to enjoy each other’s company and success – an excellent display of teamwork and teamspirit. The band played some popular numbers, some classics, some of my favourite songs and some songs of the Beatles – which was a big hit among the audience. They even played their own ‘modern rock’ version of the Beatles’ song ‘With a little help from my friends‘. Some of the other songs they played were ‘Ride Sally Ride‘ (Wilson Pickett), ‘I Shot the Sheriff‘ (Eric Clapton), ‘Black Velvet‘ (Alanah Myles), ‘Long Train Running‘ and ‘Good Love‘ (John Mayer). Interestingly, one of my favourite songs of the evening was ‘Another one bites the dust‘ (Queen), which I hadn’t heard before – odd, because it seems to be a big hit and is by Queen. The band also sang compositions of their own and I liked all of them. My favourite out of their compositions was ‘Time machine’. I would love to post links to some of the original compositions of ‘Off the Record’ but I am not able to find them. If I do, I will post links to them in the near future. One of the interesting things about the concert, was that the members of the band didn’t attempt to dance while singing – even though it was a rock concert – though they displayed a lot of energy on stage which looked like they were dancing. It was normal behaviour by an Indian rock band, and the audience probably didn’t notice it. But it is interesting for me to compare this with the behaviour of a Chinese rock band. (One might ask the question – why compare with a Chinese rock band? Why not with an American rock band? Or a British rock band? Or a Russian rock band? I know, I know 🙂 For simplicity sake, I will take a typical Chinese rock band as an example). In a typical Chinese rock band, if the lead singer is a lady, then sometimes she is probably more renowned for her dancing than her singing – it is an odd thing, I know, but that is the way it is. I knew the members of a Chinese rock band once, and sometimes during the break in-between the performance, I used to chat with the lead singer and the keyboard player. The lead singer was a beautiful lady, but her voice – in terms of its range and melodious quality – was average. But she tried to make it up by dancing on stage. Once during our conversation during interval-time, she confessed that she enjoyed dancing more than her singing! I also remember the Chinese government releasing a commemorative postage stamp for one of the leading Chinese women pop stars and how there was a lot of protest about it – many said that her singing was average and she was more popular for her dancing on stage and she didn’t deserve that honour. It is interesting isn’t it, how music manifests itself in different forms in different cultures – where in some cases the magic of the voice is supreme, while in others a physical expression of the song takes precedence? Unfortunately, I didn’t carry my camera yesterday and so I couldn’t take any picture or video of the venue (Gatsby Village) or the concert. So, this post can only be a word-picture. I will remind myself to carry my camera next time. This amphitheatre is a good place to spend an evening with one’s family, friends and loved ones – sitting on the grass, enjoying the soft touch of the sea breeze which wafts through the palm trees, munching on a chocolate eclair or a cake and listening to some wonderful music. If you are passing through my city sometime, do let me know. I can take you here. I have to say one more thing. After listening to the concert yesterday, I feel proud and jealous of the young generation today – for their talent and the way they showcase it, for their confidence and their fearlessness. One more beautiful passage from Zadie Smith’s collection of essays ‘Changing My Mind‘. This one is from the essay ‘Speaking in Tongues’. I am reading a book called ‘Changing My Mind’ by Zadie Smith. It is a collection of essays. Zadie Smith’s prose is so beautiful that I am reading it slowly and enjoying every page 🙂 Here is one of the interesting passages that I encountered in the book (from the essay ‘Rereading Barthes and Nabokov’).